India's Prime Minister Manmohan Singh (R) talks with Myanmar pro-democracy leader Aung San Suu Kyi during their meeting in Yangon May 29, 2012. Sceptics raise fear that India’s journey in Myanmar will not be smooth as it will face stiff competition from players like China. But in fact India and China can cooperate with each other in developing trilateral joint projects in the country. 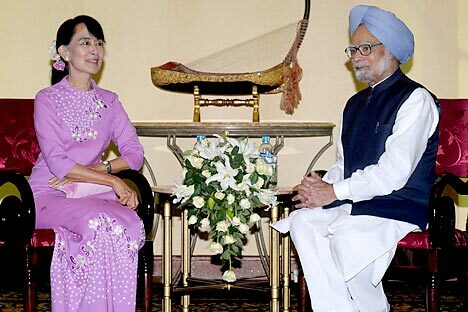 On 29 May 2012 the official daily of Myanmar New Light of Myanmar in its editorial hailed the visit of Indian Prime Minister Manmohan Singh to Myanmar in these words: “India needs Myanmar, and Myanmar also needs India, and that is the common ground.” Though Indian officials visited Myanmar in recent years, an official of the ranking of Prime Minister visited the country after 25 years, the last being Rajiv Gandhi. Much has changed in intervening years, the military rulers in the South East Asian nation have opened the path of reforms in the country, allowed the leaders like Aung San Suu Kyi to visit abroad, and conducted general elections considered free and fair. Besides these changes which attracted international attention and thus visit of leaders of major powers to the country in recent months and easing of sanctions, is the rise of Myanmar as a strategic country linking South Asia to South East Asia, and as a major connecting point and transportation bridge. This later factor has nonetheless gone into calculations of major powers including India. Though India had launched Look East policy during Narasimha Rao regime in 1990s towards developing relations with south east Asian nations, the recent years have in fact saw India’s diplomacy taking vigorous steps to promote India’s interests in neighbourhood. Both Indian and Myanmar share 1600 km long border and four of India’s states Mizoram, Nagaland, Manipur, and Arunachal Pradesh share borders with Myanmar. The relations between India and Myanmar are, in fact, very old stretching back to centuries, even millennia. The land of Myanmar too has a name in Sanskrit, Suvarnabhumi (meaning land of gold or golden land). The cultural linkages in terms of spread of Buddhism from India to Myanmar, and settlement of large Indian origin people in Myanmar too further indicate the commonalities between the two countries. There are still many Hindu shrines in Myanmar. During British rule, Myanmar, then called Burma, was part of British India. Some of the noted Indian freedom fighters like Bal Gangadhar Tilak were imprisoned in Mandalay in Burma. From this jail Tilak composed one of his most famous books called Gita Rahasya (secret of Gita). The father of modern Burma, Aung San too had good relations with Indian freedom fighters like Jawaharlal Nehru. The common linkages were however shattered after the military junta came to power in 1960s, which nationalized Indian enterprises and expelled many Indians. India too adopted a lacklustre approach to military regime and supported the democratic reform movement of Aung San Suu Kyi, the Indian educated daughter of Aung San. However, it was only in 1990s, India shed idealism and adopted a pragmatic approach to develop relations with the military junta, as it viewed Myanmar not only as a gateway to South east Asia and ASEAN, but also as an important country for trade and strategic interests. Besides the areas of trade and commerce, there are also many other areas which both the countries focused during the trip of Singh. India is wary of insurgency problem in its north east, which is partly possible due to insurgents’ connection in the border areas, parts of which belong to Myanmar. The President of Myanmar promised Singh that he will not allow the soil of Myanmar to be used against India. The joint statement read, “both leaders reaffirmed their shared commitment to fight the scourge of terrorism and insurgent activity in all its forms and manifestations.” The two countries also resolved to play an active role to promote peace and stability in the region. The coming days will likely witness hectic activities on part of both the countries to build upon the ideas and policies of the leaders of both the countries. Dr Debidatta Aurobinda Mahapatra is associated with the Centre for South and Central Asian Studies, Central University of Punjab, India.